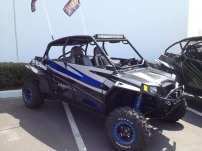 This Polaris RZR 4 seater had double treatment with a 32" Double Row LED light bar on the roof and a pair of our 4" square (4x4) post mount LEDs on the push bar out front. It is a super trick bike with tons of goodies. I'll get some night shots added so you can see the lights on. We used 2 of the deluxe wiring harnesses so the lights can be regulated independently from each other, and we used stock Polaris switches in the dash to look factory. Here is a great close side shot of the completed rig. 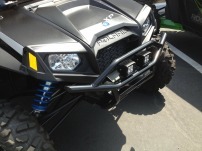 Latest RZR 4 door unit with lights all over! Full Pic of both Lites! Here you can see more of the rig with the Double Row 32" light bar on top and a pair of the 4x4 square LEDs on the nose. Nice sharp unit! !